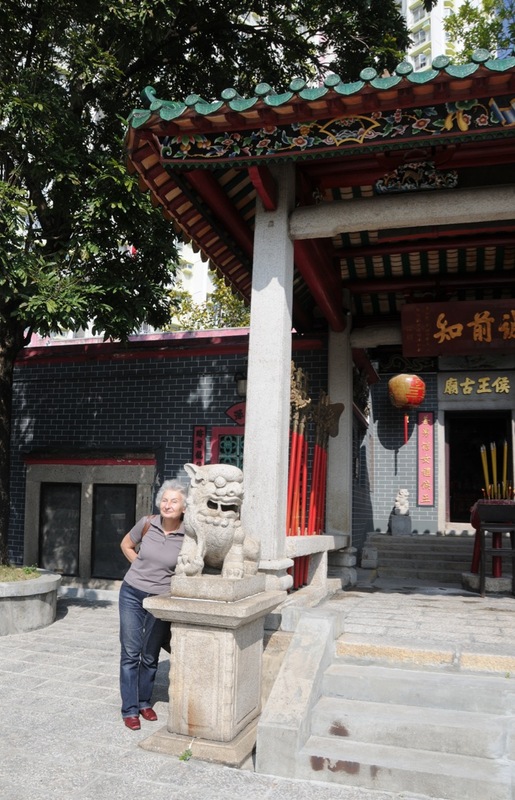 On our way to the Kowloon Walled City Park we passed the Hau Wong Temple at Junction Road in Kowloon. It sits at a street corner, but is dwarfed by the surrounding high-rise buildings. 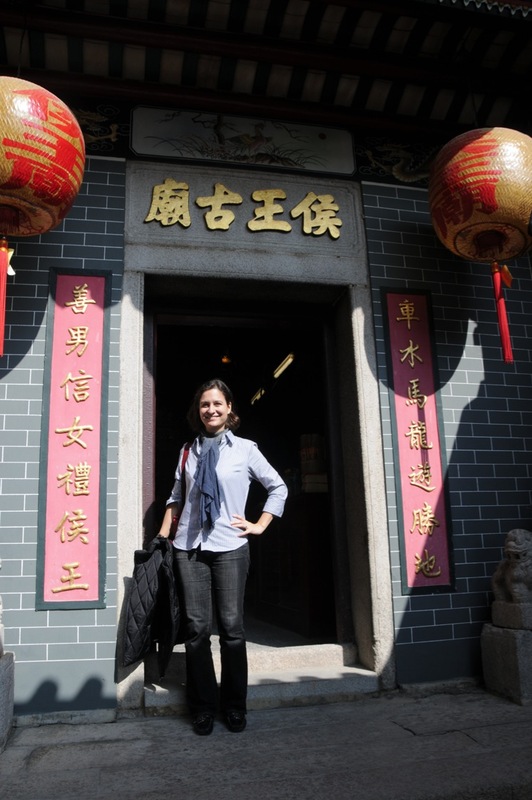 The Hau Wang Temple in Kowloon was built around 1730 but has been renovated a number of times. 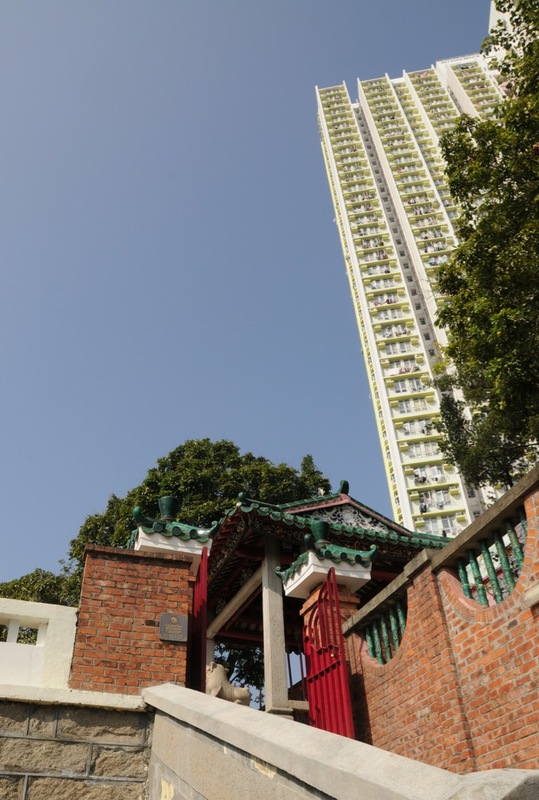 While there is no conclusive proof about the origin of Hau Wong, most people subscribe to the saying that the temple was built in memory of Hau Wong Yeung Leung-jit, the loyal general who protected the last emperor of Southern Song Dynasty to take refuge southwards in Kowloon. 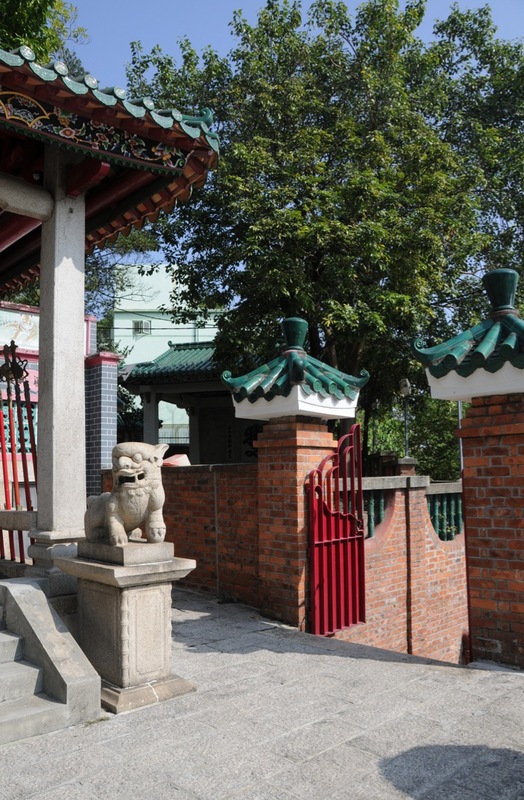 The temple consists of three buildings plus a little garden to the left of it. 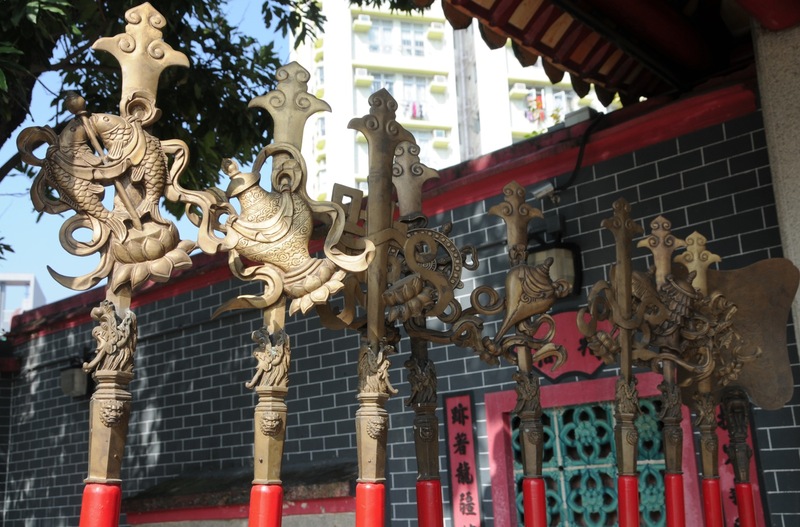 At the entrance, guarded by two stone lions, are a number of wooden swords with lovely decorations. Don’t worry, they are not real and you can’t pull them out anymore, but they are nice to look at and to take pictures of. 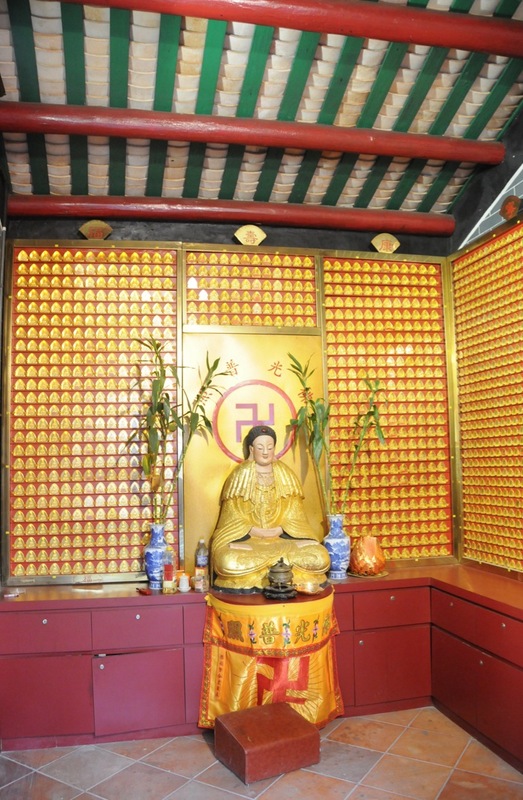 The picture below shows the Buddha in the Buddha Hall – surrounded by many little buddhas. In the small room to the left of it were the name plates of deceased loved ones. The plates looked old, but there were not dates that I could recognise, so I don’t know how long the name plates have been there. 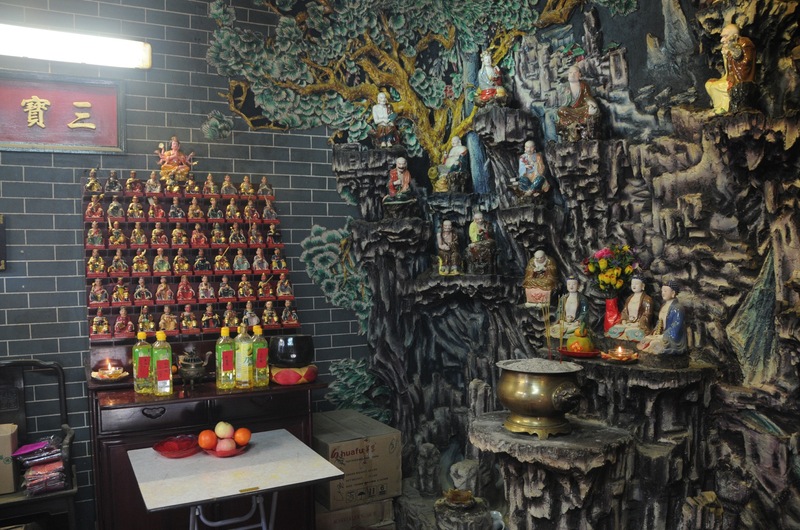 In the Lohans Hall are eighteen Buddha Guardians sitting in a fake voce, next to Tai Sui (The Sixty Gods of Time). 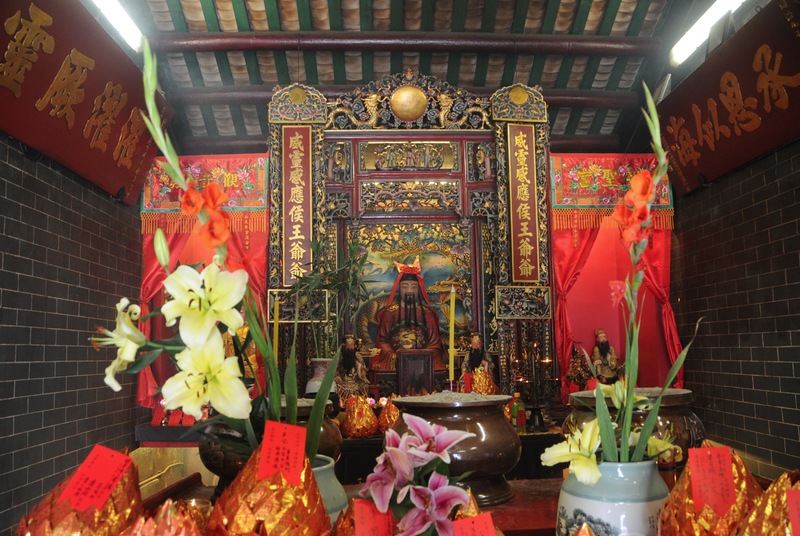 Facing the entrance of the temple is the main hall which houses the image of Hau Wong. A beautiful little temple, very small and quiet – probably often overlooked. But it’s easy to get to, when coming from Lok Fu MTR station (Exit B) just walk down Junction Road. The first photo is very well taken. I will go there.Thanks for your information.